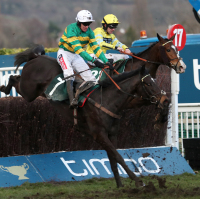 There were four equine fatalities on the final day of the Cheltenham Festival, taking the total for the week to six. Three came in the concluding race, the Johnny Henderson Grand Annual Challenge Cup Handicap Chase, when the Dan Skelton-trained North Hill Harvey and Henry Oliver's Dresden both suffered what proved to be fatal falls. It emerged later in the evening that Henry de Bromhead's Some Plan had also been lost following the race, where he was a faller at the last fence. Harry Skelton, who rode North Hill Harvey for his brother, was reported to have escaped serious injury, although he did go to hospital as a precaution. Cheltenham communications manager Sophia Dale said: "North Hill Harvey was humanely euthanized with a suspected pelvic injury and Dresden was humanely euthanized with a suspected back injury. Harry Skelton is fine and he is up and about." She added on Friday night: "Unfortunately Some Plan suffered an injury in the seventh race today and was humanely euthanized this evening. Our thoughts are with connections." Earlier in the day, Katie Walsh was unshipped from Sandsend before the last in the Randox Health County Hurdle and it was later confirmed the Willie Mullins-trained runner had suffered a fatal injury. The two other equine fatalities took place on Tuesday's opening card with the deaths of Mossback and Report To Base. Responding to the fatalities, Jamie Stier, chief regulatory officer for the British Horseracing Authority, said in a statement: "I must first express my sympathy towards to all those who will have loved and cared for the horses who suffered fatal injuries this week. "Everyone who follows this sport does so because we love these fine animals and it is extremely sad when we lose any horse. "The BHA will be reviewing the circumstances leading to the fatalities at the Cheltenham Festival. We will examine the evidence from the past week over the next few days before deciding how we will pursue the review. "We continue to use research, safety measures, regulation and education to reduce fatality rates to as close to zero as possible. This is what has contributed to the overall fatality rate within British racing reducing by a third in the last 20 years, and the fatality rate in jump racing reducing to below 0.4% of runners." Richard Johnson picked up a seven-day whip ban following his winning ride aboard Native River in the Gold Cup, and Stier added: "We will also be examining whether the existing penalties for misuse of the whip, and how they apply, constitute an adequate deterrent to jockeys."